In the creviced hills east of the Sea of Galilee, a kibbutznik stumbled on the neck of a partially buried earthen jar. Inside the jar was a roll of parchment. Experts at the Hebrew University of Jerusalem examined the parchment and found letters written by someone claiming to be the Son of God. The letters were dated to the first century, and all the evidence indicated that they had been written by Jesus Christ. A media frenzy followed. Within days the letters were translated into every language known to man. They were circulated online and everybody read them. The letters, revealing a side of Christ that few had seen, triggered a theological cataclysm. Seminarians squabbled, boards bickered, and churches split. Yet many believed that God was sending humanity a much-needed message of love and hope. Feuds ended and wars ceased. So many people turned to Christ on account of these letters that media outlets labeled their discovery the most important event in Christendom since the resurrection. Everything above is a fiction. I wrote it as a thought experiment, a kind of what-if question. What if someone did discover letters from Jesus? Would you be excited? Would you read them? Of course you would. They’re letters from Jesus. How often do you get mail from the Son of God? How might the world react to such a discovery? I ask because we do, in fact, have seven lost letters from Jesus. They’ve been hidden in plain sight for 2000 years. I am referring to Christ’s letters to the seven churches, which are recorded in the Book of Revelation. I call them lost because many people don’t know that Jesus sent seven letters, and those who do tend to leave them buried and unread in the back of their Bibles. It is a miracle these letters from Jesus have survived. They have outlasted the language in which they were written and the cities to which they were sent. In the intervening centuries, empires have risen and fallen; civilizations have come and gone. The letters from Jesus have come to us via a long chain of scribes, copyists, archivists, translators, editors, and publishers. We are blessed to have these letters, but some of their meaning has been lost in translation. How do I know? Because those who love Christ fear his letters. They see Jesus with burning eyes and sharp swords and they don’t recognize him. The Jesus in the Gospels drew people with grace, but the Jesus in these letters seems like Rambo on a rampage. Something doesn’t add up. Take the letter to the Laodiceans. In it Jesus says the Laodiceans are lukewarm and poor, and he is about to vomit them up. What does Jesus have against poor people, you wonder. And how do I avoid being spewed out? In the letter to Sardis, Jesus describes himself as a thief. Jesus is a thief?! In the letter to Pergamum, he says he’s coming to wage war with a sword. With a what now?! In the letter to Thyatira, Jesus says he will cast a certain lady onto a bed of suffering and slay her children with death. Has Jesus gone rogue? Has he joined the Dark Side? In our confusion we turn to religion for answers and learn that sometimes the Lord directs his anger against his church. “If he punishes us, it’s for our own good.” So he loves us, but he also beats us. Hallelujah. We are told that the letters contain a mix of praises and rebukes. “Do good, and God will reward you. But do bad, and the Lord will punish you.” In other words, God drives us like donkeys using sticks and carrots. Hee-haw. I don’t know about you, but none of this sounds like good news to me. In fact, it sounds exactly like the sort of message that leaves people burdened with debilitating guilt and shame. I have a different take on the letters from Jesus. Contrary to what you may have heard, I believe they are good news from start to finish. They are seven unqualified revelations of the extreme goodness and radical favor of God. Manmade religion hurts people, but the gospel of Jesus found in these letters has the power to save, heal, and deliver. Don’t want to miss out? Sign up to our email list and we’ll let you know the moment the book comes out. Can’t wait to see the book? Check out all the excerpts and draft chapters available now on E2R’s Patreon page. I want to read this book Paul! Haha – I well know you do, Moses. Hopefully it will be worth the wait. Thank you, Stephen. You’re looking forward to getting it; I’m looking forward to getting rid of it. I don’t think I have ever spent so long writing one book. Virgin territory and all that. Very good…..The One who said He was,”the same yesterday, today and forever.” doesnt change His nature after the end of “the church age” and become some destroyer of humans. On earth He wouldnt break a bruised reed or quench a smoking flax….how does He change in Revelations?….He doesn’t….so it must of necessity be metaphoric….coded for the discerning eye who knows His nature. That’s it, Mark. To understand his letters, it helps to know the Author. I don’t know how to thank God for putting you in the body of Christ. I am blessed. Thanks for working on these letters, sir. Bring your game, Hee-haw! Now that’s good preaching! So funny, Paul, I love it. Looking forward to this book and digging deeper into the letters from Jesus. Thanks! This is a bit off topic, well maybe not so much! I so appreciate the Hee-haws and the other plain talk you use Paul, it has been like a breath of fresh air. Wonderful. I see. 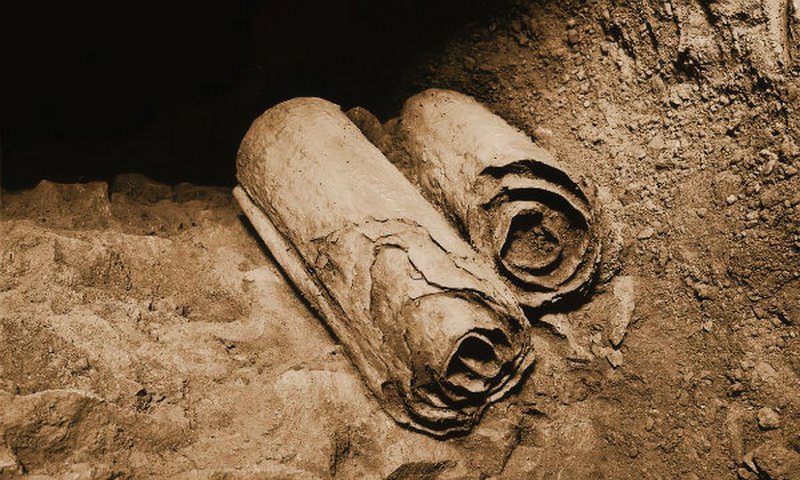 Well if a Jew discovered ancient scrolls written in koine Greek, as Christ’s letters were, they would not be able to read them. They would probably realize they had found a great archaeological treasure. It’s true that there is unrest in parts of Israel Israel, but my wife and I have driven around the country freely and discussed our faith with locals without any problems at all. It is a wonderful country full of friendly people. But I’m still curious to learn why you think I am pretending to be someone I’m not. Anyone who visits my FB page will know my blood runs all black. I never said that you were pretending to be something that you are not! Please forgive me for giving that impression. You do however use American spelling (and grammar sometimes) A friend of my late brother was the leader of the Palestinian diaspora in Auckland, and he died a few months after my brother died, both were in their 40s. Because of what I have learned, I feel that I must be part of the boycott of all things Israeli. Again I apologize for giving you the impression that I thought you were pretending to be something that you are not. I truly value your site and your teaching. Thanks for clarifying. Yes, it is true that I use American spelling, but that is because 80% of my readers are Americans. You may be interested to learn that before any book is published, it is usually read by a circle of trusted friends. The Americans among them sometimes ask me what I mean by some obscure phrase that Kiwis or Aussies regularly use. Sometimes I remove the phrase to minimize confusion; other times I leave it in because it perfectly captures my sentiment. I always struggle when making these decisions. The decision to remove a phrase can feel like I’m being dishonest to myself. I wish that everyone spoke my language and knew that when I speak of hookers and thongs, I am not speaking of ladies in risque clothing. But alas, the potential for distracting people from what really matters is often too great to ignore. Thank you Paul, I understand (that being saidI sometimes don’t understand Americanisms). Lol Paul lives in new Zealand. Lol. Amd yes I like the American writing it’s gooood. Its true too us Aussies were thongs and they go on our feet. 🙂 And we eat chups! Chur chur. Thank you. I’m delighted to hear that as I place a high value on interesting questions. Yes, me too hey.. I could never understand his these books reveal the real truth its like opposite to the new cov were God isn’t holding sins against people and calls them to salvation. I love to hear more and I couldn’t work out the confusion because that’s not the Jesus I know. Sounds awesome. Love your work! I have been going throught the Bible and studying it. This might be the third time around. I can’t remember, but when I got to Jude I saw Revelation in front of me and I asked the Lord what to do and He told me not to read it. I could be wrong, but I have since come to believe it is not Cannon. It never fit for me. I am learning much about the Lord in the 4 gospels and am digging into that gold. There were many “apocalytic” books written by the disgruntled Rabbin around the diaspora 70Ad that looked forward to an earthly kingdom with an earthly Messiah taking over the world (Millenialism is close to that is it not?) These writtings show a different character and all interpret the prophets e.g. Ezekiel and Daniel literally not spiritually. There are other writting similar the the Apocalypse of John of Patmos. There were many e.g. the apocalypse of Abraham, Adam, Baruch, Enoch, Elijah, Moses etc. All are Millenialistic and are Jewish myths to me. Any ways I am blessed reading the 4 Gosples and the revelation of Paul et al, looking at the OT through that. I am blessed by your work and teaching the Gospel of Grace !!!!! Do you know why we have four Gospels, and not three or five or some other number? Because of a guy called Irenaeus. He was the Church Father who insisted we have exactly four. He is also the reason we have most of the books in the New Testament. Two hundred years before they decided what should go in and what should not, he was quoting from the letters of Paul, Peter, James and John and calling them scripture. He also quoted from John’s Revelation. Although Revelation is an unusual book and hard to understand, I would strongly discourage anyone from excising it (or any book) from their Bibles. One thing I have learned through writing my book is the seven letters are riddled with Gospel parallels – direct quotes, shared imagery and symbols. For the Christians of Roman Asia, they were the Gospel. If they don’t sound like good news to us, it’s only because we are reading them wrong. Im exited to have these letters of Christ for us,looking forward to it ptr. Where can I buy the book? I want to give it as a Christmas present to someone. I have already bought the kindle version and am enjoying it. Thank you Paul for such an amazing book, I am loving it. Hi June. If you click the link at the top of the article, you will be taken to the book website. It lists all the purchase options. I’m glad you are enjoying the book.